Hundreds of cars will be auctioned off at Mecum’s upcoming Original Spring Classic auction in Indianapolis, Indiana next month. 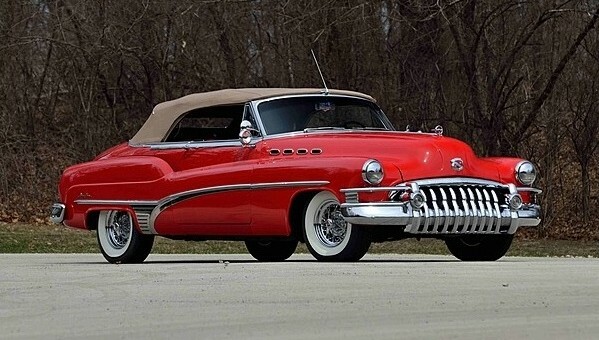 We’ve shown you a couple of other interesting lots set to go under the gavel, but none seem quite as special as this 1950 Buick Roadmaster Convertible. In the early 1950’s, General Motors’ Buick division had standout styling, engineering and sales compared to other brands, offering something for customers with any size budget. Sitting at the top of its model range was the Roadmaster, which had a unique toothy grille, quad “Ventiports” on the hood and smooth curvaceous body lines. The model looking for a new owner at Mecum’s has been restored to a high standard by a well-known Buick collector, exhibiting “superior craftsmanship in every respect”, according to Mecum. Making it appealing to collectors are its exceptionally straight body panels, which the ad states have excellent fit and gaps with no signs of previous body damage, and its near-perfect paint. The engine bay houses the original Fireball Dynaflash 320 inline eight-cylinder engine, which is hooked up to Buick’s advanced Dynaflow automatic transmission. Inside, a two-tone Red and Beige interior is complimented by amenities such as power windows and front seat, a push button radio and controls for the exterior spotlights. This Roadmaster is just one of 1 of 2,964 produced in 1950 and has had no expense spared in its restoration. It’s expected to fetch between $125,000 – $150,000 when it crossed the auction block at Mecum’s on May 16. For more info, check out the full listing here.